Are Target Date Funds Good or Bad? Are you interested in buying one fund which holds all the stock and bond mutual funds you need? A target date fund can be compared with a big box retailer or a shopping mall. In the shopping mall, you can buy everything you need at one site. In a target date fund, you get all of your investing needs met in one fund. Still wondering whether target date funds are good or bad? Here’s how these investments work. A company, such as Vanguard, Fidelity or countless others create a mutual fund for investors expecting to retire in a specific year. The premise is that the fund offers diverse financial assets in a more aggressive mix with many years until retirement and changes that asset mix to a more conservative one as the retirement date approaches. Notice the Fidelity Target date fund. With 30 years until retirement, this fund has an asset allocation of 85% stock mutual funds and 15% fixed or bond type mutual funds. As time progresses and the fund moves towards its “target date”, the asset mix becomes more conservative with greater percentages allocated to bonds and smaller percentages invested in stock assets. A 30 year old in 2015 who wants to retire at age 65 would buy the 2015 + 35 or 2050 Target date fund. Before you commit to what appears to be the “perfect” financial solution, understand that like any investment, there are advantages and disadvantages to a target date fund. It doesn’t get any easier than this. 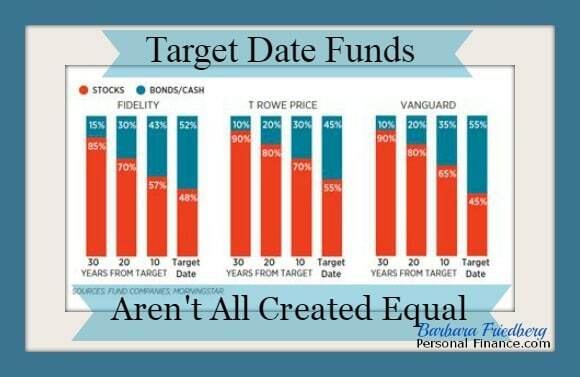 A target date fund takes almost all of the work out of investing. Once you decide on the fund, all you do is transfer your money in. The fund invests your money and rebalances according to the mandates of that particular fund. You can see from the sample fund asset allocation graphs that the fund is rebalanced periodically to reflect an asset allocation which starts out more aggressively and moves towards a more conservative mix. For the simplest investing approach, you could purchase a target date fund for a particular retirement date, or a future date when you would like to begin withdrawing from the account. Parents may consider a target date fund to align with the date Junior starts college. Many workplace retirement accounts offer target date funds, making it easy to choose one with the appropriate date for you. If you have another retirement account outside work, such as an IRA or Roth IRA, you can purchase a target date fund in your discount brokerage account. This may sound like the perfect investment approach, and for some it is. If you prefer not to do any investment oversight at all, a target date fund may be for you. As with any investment there are other factors to consider. Target date funds have cons as well as pros. You’ve learned the importance of keeping fees low when investing. When a company is bundling several mutual funds under one umbrella, you may end up paying two layers of fees. And those fees add up over time. According to Forbes’ Janet Novack in “Should You Trust Your Retirement To A Target Date Fund?” Vanguard is the only company whose target date funds consist solely of low cost index funds. If you’re paying 1% more in fees year in and year out, then that’s a percent that is not invested and compounding your wealth. The asset allocation is another potential problem. As you learned in the risk chapter, individual’s risk tolerance and capacity varies. If you are a conservative investor who suffers extreme anxiety at the smallest decline in your investment portfolio, then you may be unhappy at age 40 with 80% of your portfolio in stock mutual funds. At that allocation, a 25% drop in the stock market will cause an 20% decline in your total investment portfolio. A decline from $10,000 to $8,000 is a tough pill to swallow. A drop like that, for a conservative investor may cause extreme discomfort and a tendency to sell. And we all no, selling “low” is not a good idea. For the investor who’s risk picture doesn’t fit in with the target date funds, this investment may cause greater stress than constructing her own portfolio. Rose is age 35 in 2015. She expects to retire in 30 year at age 65, in year 2045. If she chooses the 2045 fund from Vanguard, then the current asset allocation is approximately 90% stocks, 10% fixed investments. By retirement, this 2045 Target date fund’s asset allocation would hold 50% stock investments and 50% fixed investments. Notice, the current 90% stock allocation is very aggressive and if the stock market experiences a large decline, so will Rose’s fund assets. If Rose is a moderately conservative investor, and experiences a 20% decline in her retirement assets one year, she may be extremely unhappy and be tempted to sell. Whereas, Dylan is also age 35 in 2015. He also expects to retire in 30 years at age 65, in year 2045. If he chooses the Fidelity Target Date fund, then his retirement asset allocation looks like this initially, 85% stock assets and 15% bond investment. This allocation is more conservative than Vanguards. After 30 years, at the target date, this Fidelity fund continues to be invested more conservatively. Upon retirement, the stock assets in this fund equal 48% while the bonds and cash (fixed) portion of the portfolio is 52%. As Rose and Dylan’s choices demonstrate, you can’t blindly invest in a target date fund and go to sleep for the next 30 years. You should consider your risk profile, the fund’s fees, the fund’s asset allocation and how all these factors fit together. Target date funds are neither good nor bad. After reviewing the target date fund and your own situation you can decide whether a target date fund is the right choice for you or not. There are a couple easy answers here. First off, the target date fund is only as good as the portfolio manager and how well his or her choices — not to mention fees and other terms — are suited for your particular situation. Second, for a lot of people, the best investment strategy is the one you’ll actually follow. If target funds get more invested at all and adding in a little bit of exposure to equities, then that’s great in my eyes. Your point about creating an investment plan that you’ll follow is so important. Even if you end up spending a bit more in fees, if you’re choice is doing nothing or investing for retirement with a target date fund, the target date fund is a no brainer. Great into to target date (or lifecycle, as I like to call them) funds, Barb. Definitely agree with you that you should research the fund company and the fund itself before putting any money into it. But as far as risk tolerance goes, I’d say that most people try to bee too conservative in their early years, when it’s time to be aggressive. Anton, If history continues going forward as it has in the past, then it is certainly prudent for those in their 20’s and 30’s to invest aggressively. Although with valuations in the market today on the higher end, I wouldn’t go “all in” in stocks at this juncture. I’ve never been a fan, only because they seem to underperform the market and they seem to all charge over 1% annual fees, which is my cut off for where I won’t even consider the fund. Hi Money, Higher fees can definitely eat at the investors long term returns. And if you have any interest in creating your own portfolio with low cost index funds, you may be better off on your own. I understand that the Vanguard fee structure is quite low, at 0.17% as quoted in their literature. As Mario mentioned, if the target date fund will get you investing then it’s certainly better than not investing for retirement. While I very much appreciate the credit for the quote in this article, It appears I’ve been misquoted. That was from L. Ten Haagen of Ten Haagen Financial Group in Huntington, N.Y. Thanks!